PT Patra Telekomunikasi Indonesia - Patrakom is a well-established telecommunication services company in Indonesia. 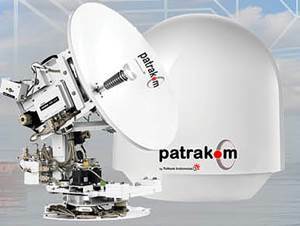 Patrakom has core competencies the provision of telecommunications services based on satellite. Its business include internet, data communication networks, voice, and video, multimedia. The Company's services has focused on the telecommunication, maritime, media, energy (oil, gas and mining), plantation and banking. Patrakom is a member of PT Telekomunikasi Indonesia (Persero) Tbk (Telkom Group), the Country's strongest telecommunication services company. Patrakom is 100% owned by Telkom Group. Patrakom is based in Depok West Java and its head office is registered at Jl Pringgondani II No 33 Alternatif Cibubur, Depok 16954. Achievement and performance of Patrakom in 2015 shows good results achievement. According to PT Telekomunikasi Indonesia (Persero) Tbk Consolidated Financial Statements (Audited) FY 2015 as cited by JobsCDC.com, total assets of Patrakom grew by 36.81% to reach Rp 472 billion as at year-end 2015. Total assets of Patrakom in the end of 2014 amounted to Rp 345 billion. Minimum Diploma (D3) holder in Secretary with a Grade Point Average (GPA) of minimum 3.00 out of 4.00 scale. Able to handling tight deadlines and multitasking job. Fluent oral and writting in English. Preferably Female. Maximum age of 26 years old. Minimum Bachelor (S1) holder in Communication, Public Relation, Business Studies. Have a good networking with media, news paper, magazine, tv and others for conduct event and promotion. Have strong understanding of social media and how to use it in an editorial environment. Able to effectively communicate information and ideas in written and verbal format, and build and maintain relationships within the community. Able to work independently with excellent attention to detail. JobsCDC.com now available on android device. Download now on Google Play here. Please be aware of recruitment fraud. The entire stage of this selection process is free of charge. PT Patra Telekomunikasi Indonesia - D3, S1 Fresh Graduate, Experienced Officer Telkom Group October 2016 will never ask for fees or upfront payments for any purposes during the recruitment process such as transportation and accommodation.